If you have children, your car probably has at least one car seat buckled in at all times. But when was the last time you checked its positioning or if your child is using the right model? A good answer is right now. The National Highway Traffic Safety Administration (NHTSA) is observing Child Passenger Safety Week from Sept. 16 – 22. Sept. 22 is National Seat Check Saturday. Parents can click here and find a full list of sites throughout Massachusetts offering free car seat checks by certified and trained professionals. The right car seat and positioning is critical because motor vehicle crashes are one of the leading causes of death among children ages 3 to 14. A car accident can come suddenly without warning and a child passenger safety seat is essential to keeping young passengers safe. Child passenger seats are generally divided into four categories: infant carrier seats, rear-facing seats, forward-facing seats and booster seats. All 50 states and the District of Columbia require child safety seats and all but two – Florida and South Dakota – require booster seats or similar devices for children who have outgrown safety seats. The Massachusetts Child Passenger Safety Law requires all children riding in passenger motor vehicles be in a federally-approved child passenger restraint which is properly fastened and secured until they are 8 years old or over 57 inches tall. 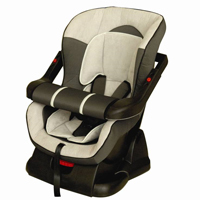 The number of children increased substantially with the passage of the Booster Seat Bill in 2008. Infant carrier seat. These are for children up to 1 year of age who weigh 20 pounds. The height limit is up to 26 pounds. Rear-facing convertible seat. These are for children who are 6 months to 1+ year of age, who weigh under 30 pounds. Forward-facing seat. These are for children over 1 year of age who weigh more than 20 pounds and under 40 pounds. Booster seat. These are for children age 4 to 8. When students turn 8 and stand taller than 4 feet 9 inches, they can transition to a back seat belt. It is recommended children travel in the backseat wearing a seatbelt up until the age of 13. Enhanced Child Passenger Safety Law, Commonwealth of Massachusetts. State Child Passenger Safety Laws, Governors Highway Safety Association. The Boston car accident lawyers at Breakstone, White & Gluck are experienced in handling motor vehicle accidents throughout Massachusetts, including car accidents, truck accidents, bike accidents and pedestrian accidents. If you have been injured, it is important to learn your rights. For a free legal consultation, call us today toll-free at 800-379-1244 or 617-723-7676 or use our contact form.